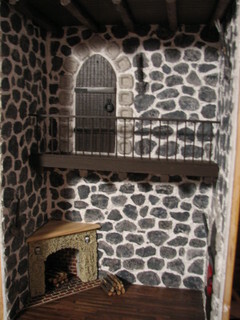 Judy Kingsley of Chelsea, Quebec, created this tutorial for customized fireplaces carved out of builders foam insulation. 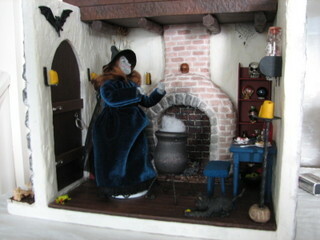 "I wanted a special fireplace with rounded legs for the Witch House I made for my mother’s 80th birthday. After thinking about how to make it, I decided to carve it out of blue foam insulation, then cover it with air-drying clay. It worked beautifully!" Builders foam (or insulation) is a product similar in consistency to "oasis," the product that the florists use for bases in arrangements. 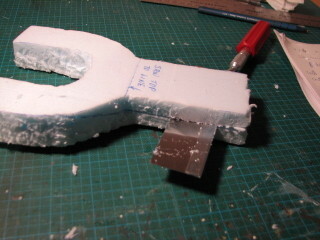 It's easy to cut using a sharp blade, and pieces can be glued together to make thicker pieces. The foam comes in 4x8-foot sheets of different thicknesses, in both pink and blue colors. It's sold in home improvement stores under a variety of brand names. WARNING: Glues that contain solvents should never be used on foam. Solvents will dissolve the foam, releasing dangerous fumes. 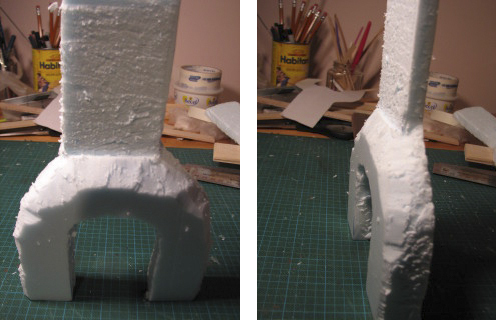 Don’t use hot glue directly on foam, as it will cause it to melt, releasing dangerous fumes. I have used Aleene’s Tacky Glue and Weldbond glue, with no problems. First make a pattern for your fireplace on a sheet of paper, and then trace it on to the foam. Cut out the fireplace. 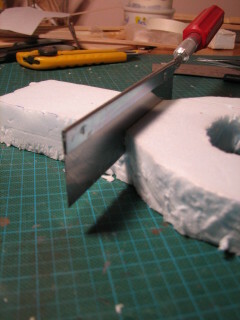 It’s easiest to cut away small chunks of foam at a time, especially around curved areas. Once the fireplace is cut out, it will look a bit rough. That's okay! Mark a line at the base of the chimney on the front of the fireplace. You will be cutting the chimney out to this line. 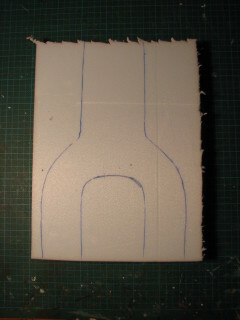 Draw a line on both sides to show where the curves will be cut out. Use an X-Acto knife or a fine-toothed miter box saw to remove the front half of the chimney. 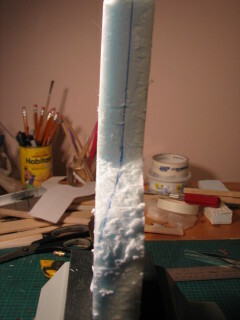 To do so, cut halfway through the foam along the horizontal line at the base of the chimney. Then starting from the top of the chimney, slice through the chimney down to the line. Your fireplace should now look like this (side view). If a piece of the foam breaks, just glue it back on. The whole thing will be covered with clay and it will never show. Carve out the fireplace legs using a sharp blade. Don’t worry if it’s not exactly symmetrical - it will be covered with clay. Have ready a small container of water, to be used if the clay starts to dry out too soon. 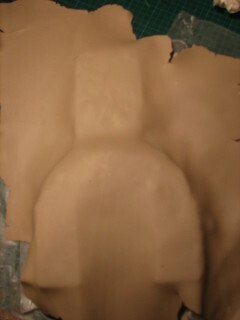 Drape the clay over the fireplace, patting it down so there are no air pockets. 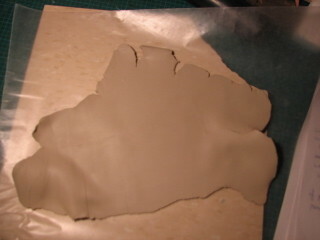 Trim off excess and use these bits to cover any holes in the clay. 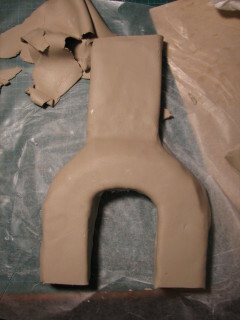 Smooth joints in the clay by dipping your fingers in water and gently brushing them over the clay. 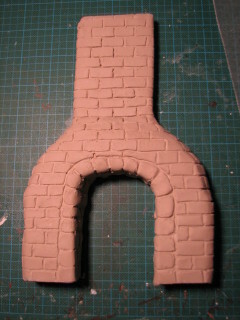 Sculpt the individual bricks or stones in the clay before it dries. If the clay starts to dry out before you are finished, dip your fingers in water and gently brush them over the clay. Use a stiff brush to stipple the front of the bricks and stones to give them texture. Allow to dry completely (overnight or even longer if you live in a very humid area). Brush the dried clay with a dirty wash to tone down the colour. Let dry. Use different coloured washes to paint the individual bricks and stones, repeating as necessary to get the colour you want. Leave the grout unpainted. Allow to dry completely. One of the nice things about using foam is that it allows you to carve out any shape for your fireplace. Here is an example of another fireplace. Notice the two little niches carved out for the skulls. 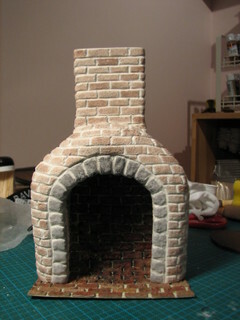 I painted the foam the colour I wanted the finished fireplace to be. 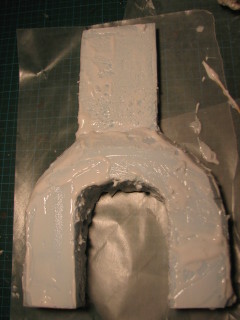 Then, instead of clay, I covered the painted foam with a product called GOLDEN Extra Coarse Pumice Gel. To make the fireplace fit into a corner, I simply glued on a triangular piece at the back, and covered it with a wood mantle cut to fit the corner. Here is the finished fireplace in the Witch Tower. This was my first ever roombox, started in 2006 and still in progress. It's made in a wine box. I made the interior walls separately from thin foam core and once they were finished, glued them to the inside of the box. The balcony posts are toothpicks. The doors are false doors, added to give the impression of more rooms. This attic (home of an elderly flower seller) was a Miniature Enthusiasts of Ottawa club workshop. Each participant finished their attic the way they wanted. I made the fireplace from foam and painted it, then coated it with GOLDEN Extra Coarse Pumice Gel, and then a final coat of paint. As you can see, the foam base can be finished with a variety of materials, such as clay, texture gels or mediums, plaster, paint, or wallpaper. There is no limit to the original fireplaces you can create using techniques like these! Thomas Saunders, of Red Deer, Alberta, is the author of the new blog Turnings in Miniature. 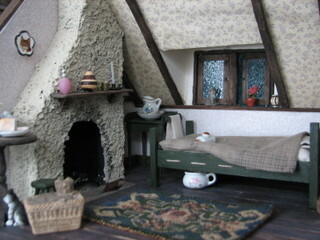 He is chronicling the construction, from scratch, of several miniature Tudor houses. "I have wanted to build a Tudor House for several years," says Tom. "I also like making furniture and I am really looking forward to making the furniture for these houses." Turnings in Miniature will also feature Tom's first love, miniature turnings. Bowls, platters, plates, pots, vases - "anything round really floats my boat!" he says. Tom uses mainly wood, stone, acrylic and metal, choosing each piece for its color or grain structure. He strives for realism, and his perfectionism shows in the delicate work. The finished pieces are true works of art. Tom's interest in scale miniatures began about 50 years ago, with model cars and trucks. Eventually it progressed to military vehicles, and then into "all things radio-controlled," he says. But scale helicopters, hydroplanes, sailboats and gliders "took up way too much room, time and money!" 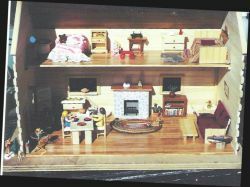 For the past six years or so, Tom has focused on dollhouse miniatures. "It doesn't really matter what it is, I just have to be making something." Decorative Pot made of boldly colored Caramel Swirl acrylic, 15/16" tall. 7/8" tall vase made from Claro Walnut Burl that included a large knot. So delicate that in some spots the wood is only 1/64" thick. 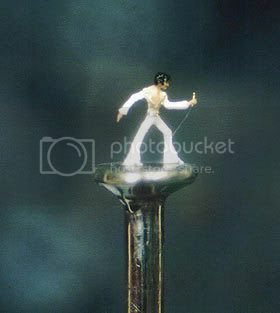 Artist Willard Wigan, of Birmingham, England, is often called the creator of the world's smallest sculptures. These amazing micro-sculptures are so small they fit on the head of a pin, on a grain of sand, or in the eye of a needle. Some are invisible to the naked eye and require a microscope to be seen. tremors. He uses a tiny surgical blade and shards of glass to carve the microscopic figures out of grains of rice or sand and fragments of sugar. The creations are painted with a single hair or eyelash, and then mounted on pinheads or needles. 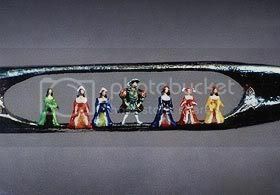 You can see more examples of this amazing miniature art at Wigan's website, and this slideshow from the BBC. This tutorial is by Lana Hiemstra, owner and admin of the Small World discussion board. 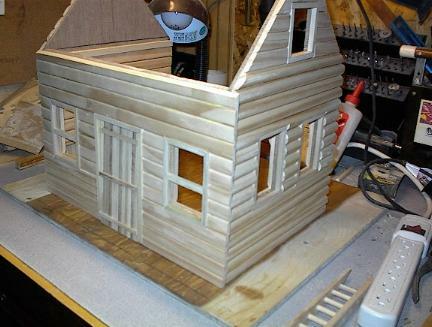 A great way to build yourself a dollhouse for just a few dollars! Click on the images for a larger view. "Building log cabins the way I like to do it is easy and inexpensive. There are other ways to create mini log cabins, this is just one." 1. First you go to a lumber yard and ask for HALF-ROUND strips of molding used in real houses for trim. They usually come in 8 foot strips for under $5, and this will go a long way! The half-round "logs" are flat on one side and round on the other. The round side goes outside the cabin so that you have flat walls inside to hang items. You can, however, choose a full round dowel. 2. Next you must decide before you glue whether you want to stain the cabin, because glue doesn't allow for most stains to adhere. I understand there are special stains that do allow it though, in which case you could stain after assembly. 3. Next is cutting the lengths you want. You will have alternating lengths to create interlocking sides and back and to make it LOOK like a log cabin should. 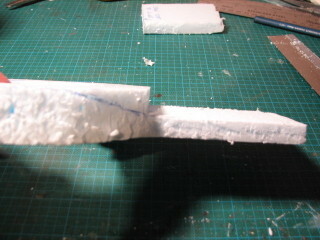 This also gives it great stability after it is all glued together. 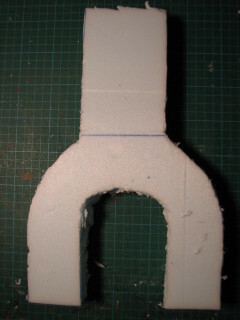 The cutting takes longest to do but is not difficult. Be sure to get the edges straight, especially on the shortest strips that will form the inside wall. If there are gaps in the walls where the sides and back fit, they can be covered with miniature trim later, but getting the edges straight minimizes the gaps. The shortest lengths (9" in this case) will determine the inside dimensions of the cabin. The inside of this cabin will thus be 9" deep. To create doors and windows, you just cut those pieces shorter and align them. 4. 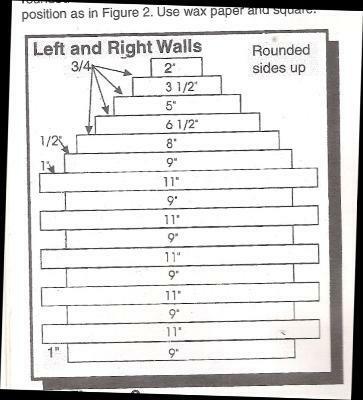 You glue each side and back separately. You need a hard, flat surface to lay them on until they are dry so they don't get out of alignment. Glue the sticks edge to edge for each side and for the back, and leave to dry. I use tacky glue. It will appear quite flimsy at this point, but don't worry... when the sides and back are fitted and glued together, it is surprisingly strong. 5. 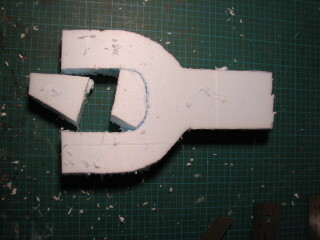 After the parts are dry, assemble them and glue together with the flat sides on the interior. 6. Once the cabin is all put together and dry, you can add trim to hide the differences in length of the strips on the sides, and add other trim as needed. 7. Floors and roof can be made out of the same half-round strips, or you can use another material for them. If you make a two-story cabin, it will work better to make the cabin a little taller to allow workable space on the top story. You can determine the slant of the roof by the lengths of the pieces you cut...the less slant, the more workable space upstairs. I don't like the looks of chinking material, so I don't use it, but some like the look of chinking better. There are many ways to achieve this, one easy way is to use twine. Cut to length and glue it into the chinks between your logs. A two-story cabin. This cabin cost less than $20 to make! 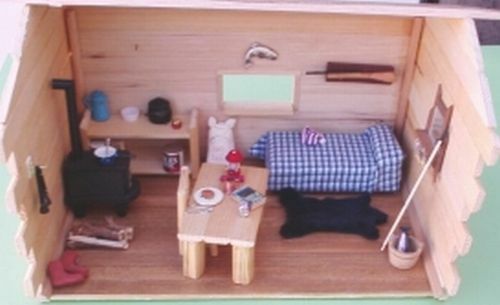 A smaller one-room sportsman's cabin. Here's an example made by another member of the Small World group, using a flat style molding on the front (the type used for mounting screens on wooden frames.) The sides are made with the half-round molding. I've updated the Do-It-Yourself section of my website, with new projects and printies added as well as some new needlework links. And don't miss all the great new history & style links in Design Reference! If you're like me, you like the historical tidbits of info that help you develop more historically accurate scenes. Well, if you're really like me, you claim it's to help develop more historically accurate scenes, but actually you just like useless historical trivia. Either way, here's a fun site for you: What Things Cost in 1803. Primarily a genealogy site put together by the descendants of Thomas Sims Graves, it contains all kinds of interesting stuff. Want to know how to properly clean a headstone? Or what the major epidemics in the USA between 1657 and 1918 were? Or when mailboxes first became common in the US? Head on over! They've also got some great graphics for printies - old 'Wanted' posters and some samples of Colonial currency.